Las Olas Boulevard from Andrews Avenue to SE 1st Avenue will be closed from Friday, March 9 at 10:30 a.m. to Saturday, March 10 at midnight. SE 1st Avenue from E. Las Olas Boulevard to the south side of the FAU/BC Tower parking lot driveway will be closed from 9 a.m. Friday, March 9 to midnight on Saturday, March 10. 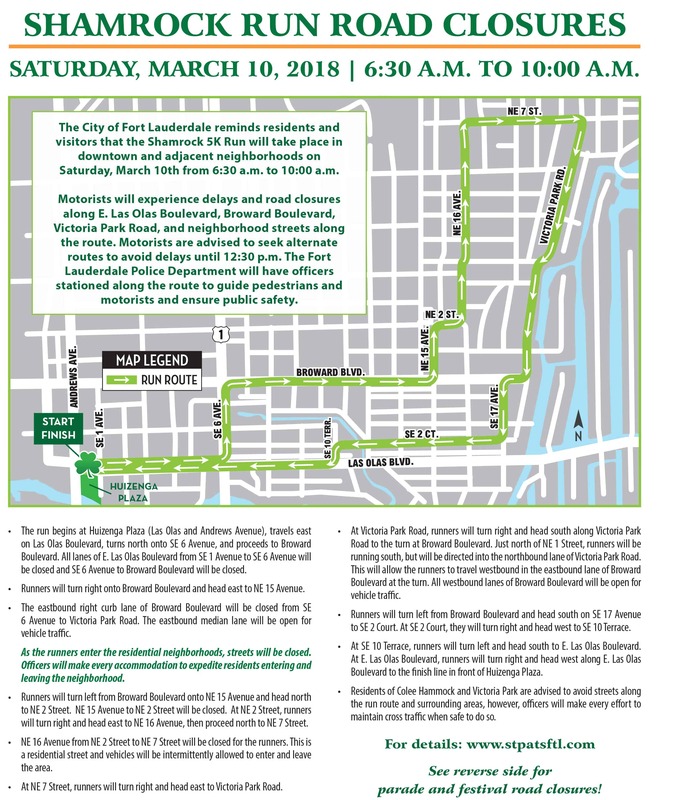 Las Olas Boulevard from SE 1st Avenue to SE 10 Terrace will be closed from 7 a.m. to 9 a.m. on Saturday, March 10 for the Shamrock Run. North and southbound traffic will be periodically allowed to cross at intersections. 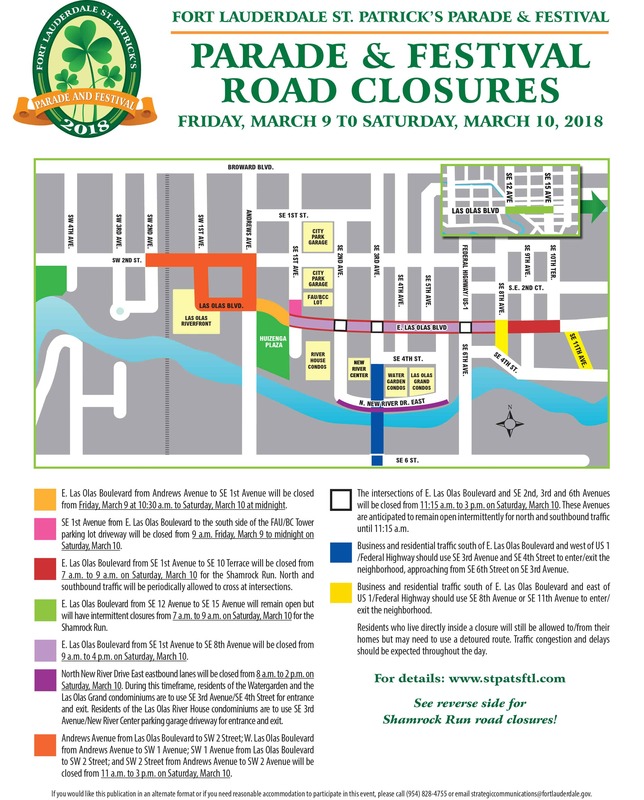 Las Olas Boulevard from SE 12 Avenue to SE 15 Avenue will remain open but will have intermittent closures from 7 a.m. to 9 a.m. on Saturday, March 10 for the Shamrock Run. Las Olas Boulevard from SE 1st Avenue to SE 8th Avenue will be closed from 9 a.m. to 4 p.m. on Saturday, March 10. North New River Drive East eastbound lanes will be closed from 8 a.m. to 2 p.m. on Saturday, March 10. During this timeframe, residents of the Watergarden and the Las Olas Grand condominiums are to use SE 3rd Avenue/SE 4th Street for entrance and exit. Residents of the Las Olas River House condominiums are to use SE 3rd Avenue/New River Center parking garage driveway for entrance and exit. Andrews Avenue from Las Olas Boulevard to SW 2 Street; W. Las Olas Boulevard from Andrews Avenue to SW 1 Avenue; SW 1 Avenue from Las Olas Boulevard to SW 2 Street; and SW 2 Street from Andrews Avenue to SW 2 Avenue will be closed from 11 a.m. to 3 p.m. on Saturday, March 10. The intersections of E. Las Olas Boulevard and SE 2nd, 3rd and 6th Avenues will be closed from 11:15 a.m. to 3 p.m. on Saturday, March 10. These Avenues are anticipated to remain open intermittently for north and southbound traffic until 11:15 a.m.
Business and residential traffic south of E. Las Olas Boulevard and west of US 1/Federal Highway should use SE 3rd Avenue and SE 4th Street to enter/exit the neighborhood, approaching from SE 6th Street on SE 3rd Avenue. Business and residential traffic south of E. Las Olas Boulevard and east of US 1/Federal Highway should use SE 8th Avenue or SE 11th Avenue to enter/exit the neighborhood. Residents who live directly inside a closure will still be allowed to/from their homes but may need to use a detoured route. Traffic congestion and delays should be expected throughout the day. The Shamrock Run will take place in downtown Fort Lauderdale and adjacent neighborhoods on Saturday, March 10 from 6:30 a.m. to 10:00 a.m. Motorists will experience delays and road closures along E. Las Olas Boulevard, Broward Boulevard, Victoria Park Road, and neighborhood streets along the route. Motorists are advised to seek alternate routes to avoid delays until 12:30 p.m. The Fort Lauderdale Police Department will have officers stationed along the route to guide pedestrians and motorists and ensure public safety. To view a map of the traffic restrictions, visit www.stpatsftl.com/news. The run begins at Huizenga Plaza (Las Olas and Andrews Avenue), travels east on Las Olas Boulevard, turns north onto SE 6 Avenue, and proceeds to Broward Boulevard. All lanes of E. Las Olas Boulevard from SE 1 Avenue to SE 6 Avenue will be closed and SE 6 Avenue to Broward Boulevard will be closed. Runners will turn right onto Broward Boulevard and head east to NE 15 Avenue. The eastbound right curb lane of Broward Boulevard will be closed from SE 6 Avenue to Victoria Park Road. The eastbound median lane will be open for vehicle traffic. As the runners enter the residential neighborhoods, streets will be closed. Officers will make every accommodation to expedite residents entering and leaving the neighborhood. Runners will turn left from Broward Boulevard onto NE 15 Avenue and head north to NE 2 Street. NE 15 Avenue to NE 2 Street will be closed. At NE 2 Street, runners will turn right and head east to NE 16 Avenue, then proceed north to NE 7 Street. NE 16 Avenue from NE 2 Street to NE 7 Street will be closed for the runners. This is a residential street and vehicles will be intermittently allowed to enter and leave the area. At NE 7 Street, runners will turn right and head east to Victoria Park Road. At Victoria Park Road, runners will turn right and head south along Victoria Park Road to the turn at Broward Boulevard. Just north of NE 1 Street, runners will be running south, but will be directed into the northbound lane of Victoria Park Road. This will allow the runners to travel westbound in the eastbound lane of Broward Boulevard at the turn. All westbound lanes of Broward Boulevard will be open for vehicle traffic. Runners will turn left from Broward Boulevard and head south on SE 17 Avenue to SE 2 Court. At SE 2 Court, they will turn right and head west to SE 10 Terrace. At SE 10 Terrace, runners will turn left and head south to E. Las Olas Boulevard. At E. Las Olas Boulevard, runners will turn right and head west along E. Las Olas Boulevard to the finish line in front of Huizenga Plaza. Residents of Colee Hammock and Victoria Park are advised to avoid streets along the run route and surrounding areas, however, officers will make every effort to maintain cross traffic when safe to do so. Traffic congestion and delays in and around the detoured areas should be expected throughout the day on Saturday, March 10. The Law Firm of Kelley/Uustal Presents the Fort Lauderdale St. Patrick’s Parade and Festival on March 16! © Fort Lauderdale St. Patrick's Day Parade And Festival, Inc. | All Rights Reserved.